Earn $0.55 in Podium Club credit (55 points)What's This? The Camelbal Podium® Dirt Series is designed for those who want to take their adventures to the dirt without tasting it. 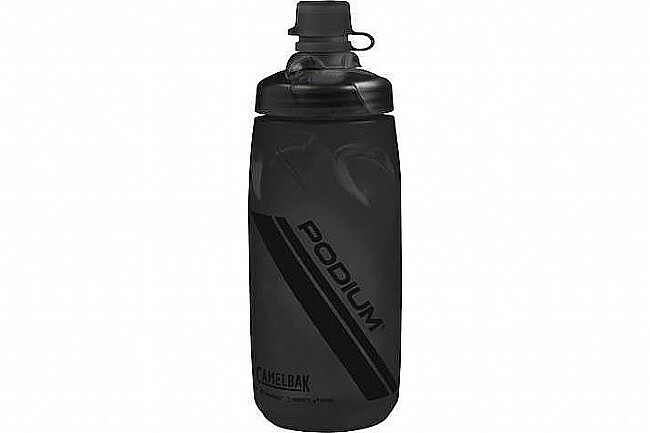 As the ultimate bike bottle for both recreational and competitive cyclists alike, it features an integrated mud cap to keep the dirt out of your drink, a high-flow self-sealing jet valve and easy to squeeze ergonomic design. Integrated Mud Cap: Keeps dirt out of the nozzle. Innovative Self-Sealing Jet Valve™ Eliminates splatters and spills. Removable Nozzle: For easy cleaning. Positive Lockout: For leak-proof transport. BPA, BPS, & BPF free Trutaste™ polypropylene with Hydroguard™ prevents plasticy bottle taste. Over the past five years I have phased out all of my crappy old water bottles. I hated having caps leak and trying to match bottles and caps before every ride. So I have switched all my bottles to Camelbak...I have about 12 bottles and switch them out with different caps and colors to make it easy for getting ready for ride. They never leak, direct water or my energy drink into my mouth consistently without and issue. I like the stop switch for shaking up my drink powders (like scratch labs), it makes it easy to rehydrate during a long ride if you are stopped for water and need to make a mix. I got the Podium Dirt Series bottle for my Salsa Warbird third bottle mount, which is on the outside tube (behind the front wheel)...regular bottles got so dirty, I didn't want to drink from the bottle there...the dirt cap on this bottle is a perfect solution. Finally, a common sense approach to drinking from a clean water bottle when riding limestone or gravel trails.